Have you been struggling with how you do bookkeeping in your small business? Does it seem like you can never make a dent on the financial administrative side or that you can never get organized enough to make headway? This article is about getting your head in the game with your business in mind. A Proper Set of Books Is Crucial to the Success of Any Business. Large companies have entire bookkeeping and accounting departments staffed by a large number of employees, so it must be pretty important. Small businesses probably don’t have that luxury. But it is important to them too. The task usually falls to the owner of the business or their spouse because they are not ready to hire an employee to do it and they fear that hiring an accountant will be too expensive. 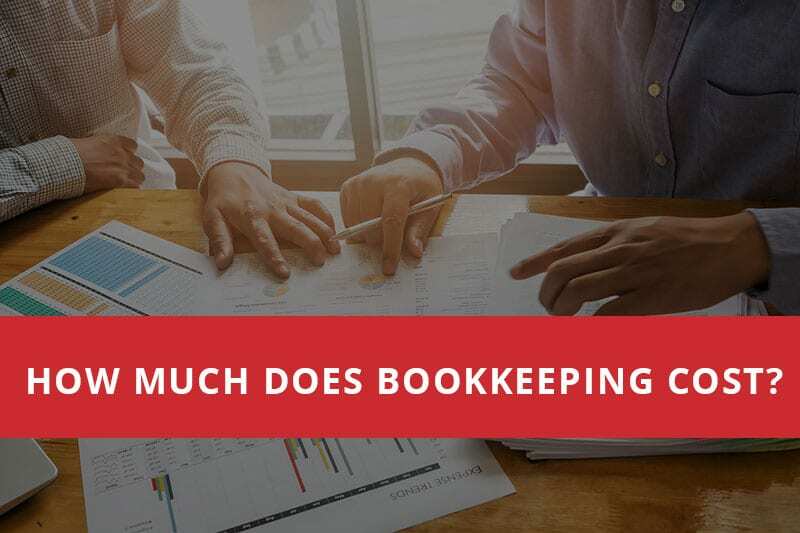 Then there is the question of how to actually do the bookkeeping while also running the business – a shoebox, manually or bookkeeping/accounting software (and which one). Any business must get their numbers right on a timely basis and then put those numbers into a format that is understandable to the owner and anyone outside the business who may have an interest so that sound business decisions can be made. Why Keep a Set of Books? The first consideration, then, is why is it necessary to keep a proper set of books? At a minimum, every business has to comply with federal, state and possibly local tax laws. The easiest way to legally minimize a business’ tax liability and comply with all tax laws is to have a proper set of books. The easiest way to run afoul of taxing agencies and risk losing your business, short of not being properly capitalized, is to not have a proper set of books. A structured, consistent and timely method of keeping track of income and expenses ensures that taxes can be planned for in advance and that all tax laws are complied with when required. The second consideration involves outside entities who may want to know what is going on with the business from a financial standpoint. Most likely this is a situation where the business is looking to acquire capital to maintain or expand the business. The sources of this capital can be banks, who are very diligent in evaluating the business for purposes of a loan, and investors, who should always be diligent in evaluating the investment in the business in return for a share of the ownership. Other examples include a contractor who wants to get a license for their business in the state in which they operate, or companies that want to contract with Federal government. In all these situations, financial information is going to be required and a proper set of books, kept up to date, can quickly allow the disclosure of this information. Without a proper set of books, putting the information together can be time consuming and very costly and may result in missed deadlines and lost opportunities. At some point in time, most small businesses fulfill their purpose. Planning for the discontinuance or sale of the business and its proper valuation should always be a consideration. What Is a Proper Set of Books? A bookkeeping system should follow basic principles but be tailored specifically to the needs of the business. A service business has different bookkeeping requirements than a manufacturing business or a retail business. Some businesses deal strictly in cash while others send a bill to their customers and wait a period of time to be paid. A proper set of books are only as good as the time spent in initially setting them up and this should always be done in consultation with a professional such as a Certified Public Accountant. Don’t guess at what you need or let some bookkeeping software make the decisions for you. This is not a costly process and can save a business a significant amount of money in the long run. The starting point for any business should be a chart of accounts. A chart of accounts is nothing more than a listing of the potential types of transactions a business may encounter and is helpful in categorizing them (especially for tax purposes). Again, the choice of a chart of accounts for any business should be made in consultation with a professional accountant. Cash receipts – the money a business collects from its customers. Cash Disbursements – the money a business uses to pay its bills. Invoices – the bills a business sends to its customers for the work done for them by the business. Payables – the bills received by the business that must be paid for the goods and services it needs to operate. General Journal – used to record unusual items or adjustments recommended by an outside accountant to make sure all financial transactions of the business are recorded. These journals are normally used on a daily or weekly basis, depending on the size of the business. On a periodic basis (not longer than a month or quarter) they are totaled and the amounts are transferred to a General Ledger which is organized along the lines of the Chart of Accounts. The totals for each account in the General Ledger are then used to create financial reports that show the financial condition of the company and its profitability as well as in preparing tax returns. That, in a nutshell, is what constitutes a proper set of books. Again, this will vary depending on the type of business. Now, how to do all of this in an easy, timely, consistent and, most importantly, cost effective manner. 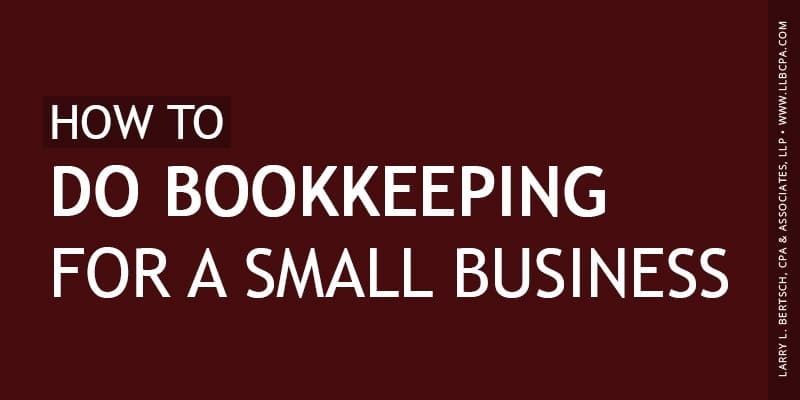 Here are the steps a small business should follow to properly do their bookkeeping. Consult with an accountant to determine the financial needs of the business. Have the accountant design a Chart of Accounts. An accountant should have a template that can easily and quickly be tailored to the business’s specific needs. Determine how the recording of transactions will be handled. Shoe-box. If you have read this far it should be clear why this is not an option. Yet many businesses still do it. Manually. Back in the good old days, bookkeeping journals and ledgers were kept in big books filled with sheets of columned paper where all the transactions were manually written and totaled. It worked but was obviously very burdensome. There are better ways that can accomplish the same thing. Spreadsheet. A good set of books based on the manual system mentioned above can be set up in a spreadsheet and work surprisingly well. A professional accountant should have developed such a system and be able to adapt it to most small businesses. Computer software. For businesses that require more sophistication, have lots of transactions or that just like a lot of bells and whistles, there are a number of computer software programs that will provide, in most cases, an excellent set of books. They can be, however, expensive, hard to learn and not always easy to tailor to the specific needs of the business. Also, they may not be able to expand easily with the rapid growth of a business. They are the most popular option these days and most offer several different versions that specialize, in the opinion of the software company, in different size businesses and industries. The key here, and where the biggest problems arise, is in making sure that the user of the software is properly trained, that the program is properly set up and that an accountant be consulted when any changes are thought to be necessary before they are made. Any limitations of the software, and they do exist, should also be understood. Use a bookkeeping or accounting service. In this situation, the business owner turns all the information over to a professional bookkeeper or accountant who performs all the tasks mentioned above and provides a set of reports on a periodic basis. The only responsibility of the owner is to get the information, properly categorized, to the bookkeeper or accountant in an organized and timely manner. Most services have a system for doing this and probably use one of the software programs mentioned above. Costs for these services usually run between $35 and $75 an hour, depending on the experience and competency of the service provider. Some will charge on a flat monthly basis. Work with an accountant regularly. Regardless of the method, the business should always work with an accountant on a periodic (preferably monthly) basis to make sure the bookkeeping is being performed properly, that meaningful reports are generated on a timely basis (normally referred to as financial statements) and that some time is spent analyzing the information and planning for the future, especially from a tax standpoint. Related: How Much Does Bookkeeping Cost? Is this simple? It can be if set up properly. Successful businesses quickly realize the benefit of having a proper set of books early in their existence. Unless a small business owner (or, as is most often the case, their spouse) is specifically trained to do so, they should not be doing their own bookkeeping. In the long run, it will be much more beneficial and cost effective to focus on the day-to-day operations of their business. Hiring a professional small business financial manager, such as a Certified Public Accountant, will ensure that the bookkeeping and financial end of running a business will be properly handled at a reasonable cost, allowing the business owner to do just that. If you’re a Las Vegas business owner, you need a Las Vegas bookkeeper. It’s easy to fall into the trap of taking care of your bookkeeping yourself to save money, but a qualified professional handling your books can help put you toward financial success because it’s their job. Handling all of this can also result in a lot of wasted time that you could spend doing what you love—running your business. 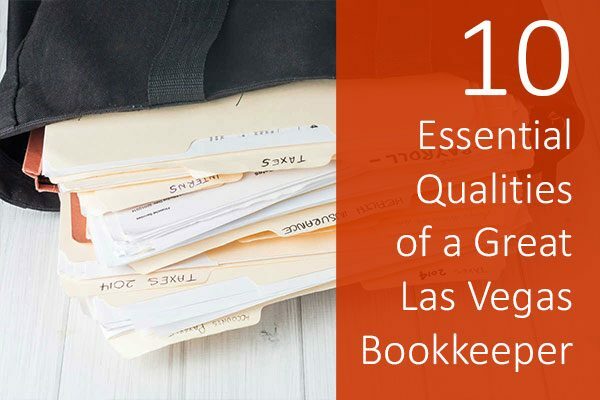 The Vegas valley contains a vast number of bookkeepers and accountants that have the chops to crunch your numbers and do your taxes, so how do you know which one to choose? Finding someone with the right certifications is easy, but you’ll be much better off with someone who has integrity and fits in with your company culture. Check out these 10 qualities that would benefit your team and help your business. Experience. The more experience a bookkeeper has, the more likely they’ll be able to handle whatever issues crop up over time within your business. Knowledge. Ask these questions: Is the Las Vegas bookkeeper accredited? Are they familiar with a variety of bookkeeping systems? How and where were they educated? Willingness to learn. Banking systems and technology often change. Bookkeepers should be willing to learn these new systems to better serve their clients. Honesty. This person is going to have access to private information. Do they have a reputation for honesty? Request references from past clients. If a mistake is made, will they be up front with you? Reporting transparency. Accuracy is one of the most important traits of any Las Vegas bookkeeper. According to a FoxBusiness.com article by Enrico Palmerino, when they are on top of their data entry that means you have accurate records “at your fingertips” and can act quickly if issues arise. Excellent time management. You never know when you’re going to need financial records. Does your bookkeeper have everything current and ready? Communication skills. A good bookkeeper communicates their knowledge clearly. They also practice good listening skills and will ask as many questions as possible to make sure you’re both on the same page. Credit management. Many business owners use credit cards. A good accountant will help you come up with a credit management plan so you don’t end up accruing excess debts or fees. Reputation. Ask around to find out what kind of reputation your prospect has. You can also check their grade on the Better Business Bureau website or check out review sites like Yelp. Reliability. Is this person going to be there when you need them? Is your prospect willing to help you out if an emergency arises outside normal hours? Be sure to get clarification on whether there’s a fee for emergency calls. If you want to save time and money, hire a Las Vegas bookkeeper to help you take care of your business. Contact us here at LLB CPA and Associates. With our years of experience and caring staff determined to work hard for your business, you’ll be in great hands. We even offer free consultations, so when you’re ready to find a bookkeeper, give us a call. Balancing the books probably ranks low on the list of tasks you look forward to undertaking each month. Nevertheless, unfortunately it’s an inescapable part of doing business and is something you have a duty to stay on top of, no matter how large or small your commercial outfit. It’s also in your best interests to do this, since bookkeeping mistakes can lead to significant financial consequences and expenditure. 1. Failing to file receipts and expenses. While this requires effort and can feel unimportant during busy periods, organizing your receipts and tracking expenses in the correct categories is crucial for justifying deductions and reimbursements you claim. It’s part of managing payroll for the company. Create a system for doing this consistently, and make sure your team is fully briefed too. It’s vital to correctly distinguish between non-employees (such as independent contractors, freelance workers and consultants) versus employees. Different rules and classifications apply to these groups of workers, and getting it wrong can result in misfiling taxes. 3. Failing to reconcile your books with your bank statements. This must be done religiously on a monthly basis, in order to protect your final exposure and avoid getting into potential difficulties further down the line. 4. Neglecting to maintain records. You would be surprised at the problems potentially caused by not keeping a paper trail of documentation, including financial statements, which may be required for audits and tax returns. This includes having a backup system for electronic records, which are always susceptible to corruption or loss. 5. Avoiding the help of experts. 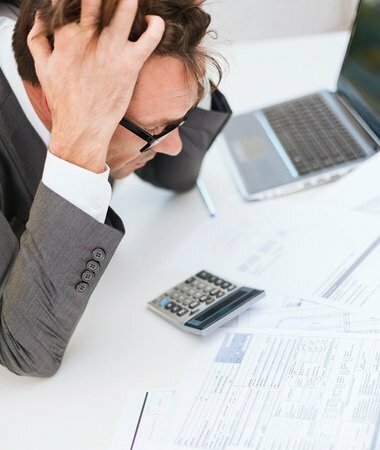 The ins and outs of bookkeeping are complex, and running a business can be overwhelming enough without having to worry about compliance. 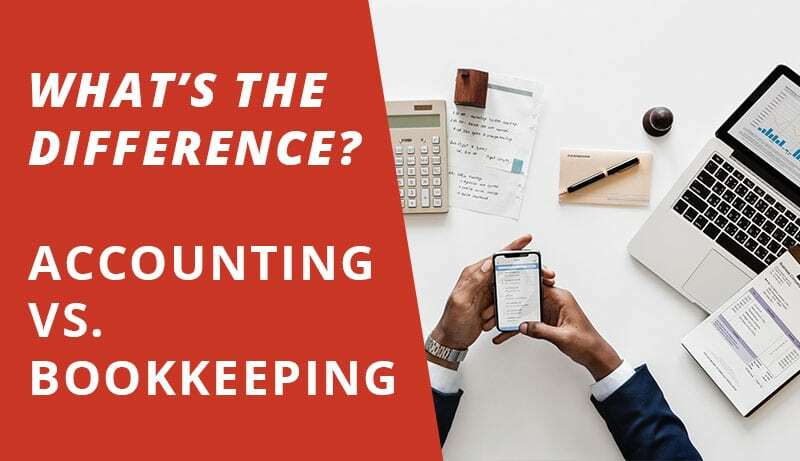 There’s no shame in delegating all bookkeeping services to professionals, who are adept at quickly and efficiently handling what’s required, as well as spotting and alerting you to past bookkeeping mistakes and accounting discrepancies. If you’re on the lookout for professional and affordable bookkeeping services, Larry L. Bertsch, CPA & Associates has been a trusted member of the accounting community since 1964. Take a quick peek at the full range of bookkeeping services we offer here, or call us at (702) 471-7223 to make an appointment or to schedule a free consultation.